People ask me “Why fermentation?” Of all the many hobbies and passions I have, why has this strange phenomena captured my attention...and my heart!?! The answer is, I don't exactly know; sometimes I feel as though the bacteria chose me, and not the other way around. I was going about my business, homesteading, re-wilding, raising children and goats alike and fleeing the insanities of modernity when one day I found myself holding a copy of “Wild Fermentation” by Sandor Elix Katz in my hands, while one of my best friends was experimenting with letting his food sit out on the counter to “culture.” I was skeptical, to say the least. So I picked up the book and started thumbing through it, ready to shoot holes in the ideas of whatever knuckle-head had convinced my homie to rot his food a bit before eating it; I teased Raymond that he was making high grade compost for himself; but as I looked further & further into the book, I became more & more intrigued. Meanwhile, Susan Weed's recipe for Dandelion Wine caught my eye, and so in the spring of 2007, I made my first batch of home-made hooch, picking thousands of little dandy petals and mixing them with sugar, water and ginger, unknowingly opening a can of worms from which I now can never escape...nor do I want to! Many moons later, I find myself more deeply immersed in the forest, more satisfied with my off-grid lifestyle, and more humbly grateful than ever to the many cultures and the amazing plethora of fermented beings whom I share my home and life with. Fermentation is older than written history, older than written language, & some say older even than spoken thought itself. Our ancient ancestors knew (as chimps & elephants know,) that when a fruit fell to the forest floor and spent a little time there, its effects were delightful! Some speculate that even before people knew how to keep fire, they knew the magic of fermented honey water; found in wild hives where rain water had found its way, bringing with it oxygen, and thus awakening the sleeping yeasts. Humans today rely heavily on chemical preservatives, electrical appliances and massive and complex storage and distribution systems to get their food. These systems are taking an unfathomable toll on our planet and our souls. We view food as fuel, rather than the nourishing life energy that it is and fill our bellies with dead disembodied food. The effects of this insanity are readily apparent all around us; in the quality of our air and drinking water; the treatment of the plants and animals which we feed upon; the degradation of our soils and ecosystems; and the deep unhappiness in our hearts and vast emptiness in our eyes. Here in Wilderlandia, we are co-creating an alternative reality to the current paradigm. Viewing ourselves not separate from, but inextricably woven into the very fabric of life, we seek to harmonize with our local ecosystems and the larger biosphere of which we are a part. Food is one of the fundamental ways in which we seek to impart change, reviving the cultural traditions of our ancestors and reclaiming the relationship so imperative to our survival; for we truly are what we eat. Pele's Fire Mead, a blend of ginger, turmeric & chipotle, bubbling away happily by the fire! Today i sit, steaming mug of turmeric & ginger bliss in my hands, gazing out onto the wintry scene unfolding outside my window; i ponder the ways that my ancestors survived days like this. Oh, I've dabbled in living outside in winter, spending freezing nights huddled around a fire that couldn't quite penetrate the cold in my bones in the tipis in Oregon; feeding endless logs to woodstoves in houses without walls in Tennessee; schoolbusses & yomes in North Carolina; straw-bale wonders in Northern California; wet winters in Hawaii where i wished for a woodstove to dry out beside. Yes, we've tried winter in many structures. Now i sit behind solid walls of wood, with insulation, even! and oh, do i give thanks! i watch the Eastern Bluebirds, all ruffled up, 1 female and 4 males; and as the wind whips the snow into swirling furies of cold, these birds are much more concerned with mating and worms, than warmth. And my mind goes to my ancestors. How did they know how to preserve food through the cold winter months? How many mistakes led them to understand the mysteries of fermentation. And by what great good fortune do i find myself here, in this place and time? As everyone speeds forward in ever increasing lines of progress, i hold space for the stillness, the quiet infinitesimal movements of the micro-herds working for me, for life, in the jars and carboys that i've chosen to call my friends; transforming carbohydrates into complex chains of sugars; sugars into alcohol; seeds into food; milk into medicine; preserving the abundance of my hard work in spring, summer and fall, into the things that sustain my family through the winter. If you do not yet know these mysteries, i invite you to enter into the food ways of your ancestors. Whatever culture we individually may have come from, we are all human; and every known human culture has a history with fermentation. Discover your roots, take a class, read a book, make some kraut. Begin to know your food and thereby yourself in a more intricate and intimate way. You will never regret the decision, i promise! Today my good friend, Kyle Nine Toes, gifted me some of the tastiest treats that Appalachia has to offer: ramps. Allium tricoccum is a North American species of wild onion widespread across eastern Canada and the eastern United States. Under much debate, ramps are often the target of local poachers, who will go through & harvest an entire patch, bulb & all, rather than leaving most bulbs behind to come up again in subsequent seasons. Kyle handed me an armful of leaves with no bulbs; this is his method of harvesting, ensuring that the patches he tends come up healthy year after year. Poking their distinct & delicious heads up through the abundant earth along side these amazingly sweet oniony yummies are morels (Morchella esculenta), my favorite fungi! A meal of ramps & morels sautéed in a little bear fat is one of the most divine & telling apparitions of spring! Ramp pesto, ramp pate', ramp butter, even ramp wine! Everything is better with ramps! 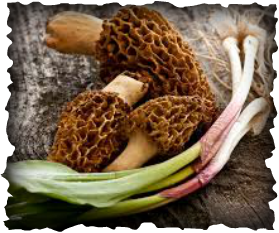 And once you've sampled morels, you will never think of mushrooms the same; distinct & delicate & so beautiful! An avid & sometimes obsessed & sometimes nomadic & always wild fermenter & culture shifter...find her scampering in a forest near you!